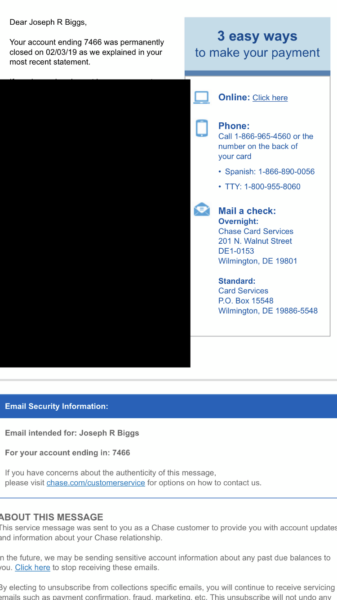 Chase Bank abruptly closed the personal account of US Army combat veteran Joe “Rambo” Biggs. Mr. Biggs is a very vocal Trump supporter with a bluecheck verified Twitter account and has over 200,000 followers. “Chase bank just closed out my account!” Biggs said on Twitter Saturday. Joe Biggs told The Gateway Pundit that he was in financial good standing with Chase Bank and had an account with them for almost 20 years. “I’ve had my account with Chase since around the year 2000,” Biggs said. Chase Bank sent Mr. Biggs an email letting him know his account had been permanently closed. Joe Biggs told Gateway Pundit that he walked into a local Chase Bank branch to speak to a bank teller about the email he received. The person at Chase Bank told Joe Biggs that she couldn’t see why his account was closed but that he would be receiving an explanation in a letter sent by mail. Joe Biggs is a US Army combat vet and told The Gateway Pundit that his Army retirement was deposited into his Chase Bank account. Chase Bank withdrew all the money that was in his account and gave Biggs a wad of cash. “I have to find a new bank now,” Biggs told The Gateway Pundit. Tyranny from big tech and big banks in the US is reminiscent of the ‘social credit score’ in China which is used to silence and control the population. Last week, Big League Politics reported that Chase Bank shut down the personal bank account of Proud Boys leader, Enrique Tarrio. Political activist and reporter Laura Loomer was recently banned from Twitter, PayPal, Uber, Uber Eats, and Lyft because she tells the truth about Sharia law and Islam. How is the US any different from a Communist nation if Americans live in fear that if they dare express their political views they will be unable to use various financial services that are essential to living in a modern society? Where the hell is Congress?